The Musée National d'Art Moderne's fascinating insight into the influential polymath André Bloc. Engineer, architect, artist, editor, critic, André Bloc in 1930 founded the magazine “L’Architecture d’Aujourd’hui” highlighting the critical debates of the post-war era and disseminating 'international modernism'. He then founded the magazine “Art d’Aujourd’hui” (1949) which became “Aujourd’hui” (1955-1967), advocating the integration of the arts. In 1951, André Bloc founded with Felix del Marle the group “Espace”, which encouraged integration of arts in architecture in order to "promote the collaboration of the painter, the sculptor and the architect". 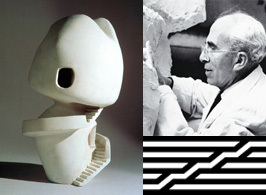 Bloc co-opted the neo-Plasticism of the 1920’s into the modern avant-garde, before moving in the late 1950’s to a sculptural approach to architecture. In the 1950’s, André Bloc turned his own house in Meudon into a testing ground for the synthesis of arts, designing it himself. He accomplished this symbiosis between architecture and sculpture with the “Habitacles”, he realized in his garden in 1962, and his house in Carboneras, Spain, (1966).